For counties with a similar name, see Carbon County (disambiguation). 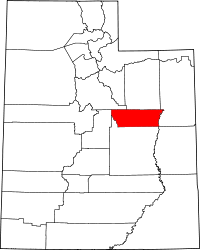 Carbon County is a county in the U.S. state of Utah. As of the 2010 United States Census, the population was 21,403. Its county seat and largest city is Price. The Price, UT Micropolitan Statistical Area includes all of Carbon County. Carbon County was part of Emery County which was founded in 1880. The demographics along the Price River changed with the construction of the Denver and Rio Grande Western Railroad in 1883 and the development of coal mines, largely in upper Emery, to fuel the railroad. The Utah Territory Legislature was partitioned to split off the north part, and thus it established Carbon County effective March 8, 1894. It was named for the element Carbon, to emphasize the industrial nature of the area. Carbon County is the second largest natural gas producer in Utah (after Uintah County), with 94 billion cubic feet produced in 2008. The Green River flows south-southeastward along the county's east border. The lower central part of Carbon County is a continuation of Castle Valley in Emery County, but in Carbon the valley is ringed with mountains - the Wasatch Range to the west and northwest, and the Book Cliffs to the north and northeast. The county generally slopes to the south and east; its highest point is Monument Peak on the crest of the Wasatch Mountains near the midpoint of the county's western border, at 10,452' (3186m) ASL. The county has a total area of 1,485 square miles (3,850 km2), of which 1,478 square miles (3,830 km2) is land and 6.1 square miles (16 km2) (0.4%) is water. As of the 2010 United States Census, there were 21,403 people, 7,978 households, and 5,587 families in the county. The population density was 14.48/sqmi (5.59/km²). There were 9,551 housing units with an average density of 6.46/sqmi (2.50/km²). The racial makeup of the county was 92.31% White, 0.43% Black or African American, 1.18% Native American, 0.58% Asian, 0.01% Pacific Islander, 3.03% from other races, and 2.36% from two or more races. 12.42% of the population were Hispanic or Latino of any race. There were 7,978 households, of which 30.16% had children under the age of 18 living with them. 54.50% were married couples living together, 10.65% had a female householder with no husband present, and 29.97% were non-families. 25.50% of all households were made up of individuals (one person), and 11.07% had someone living alone who was 65 years of age or older. The average household size was 2.61 and the average family size was 3.14. The population contained 30.41% under the age of 20, 6.82% aged 20 to 24, 23.73% aged 25 to 44, 25.48% aged 45 to 64, and 13.56% who were 65 years of age or older. The median age was 34.4. For every 100 females, there were 98.40 males. For every 100 females age 18 and over, there were 96.88 males. Carbon County historically has been the base of Democratic Party support in strongly Republican Utah with its sizable blue-collar population. It voted for Bill Clinton in 1992 and 1996 by wide margins. In 1964 Lyndon Johnson carried 72.7% of votes in the county. At the state level it was no less Democratic; in the 1992 gubernatorial election it was one of two counties (the other being Summit County) that voted for Democratic candidate Stewart Hanson over Republican Michael Leavitt. After the turn of the millennium, however, Carbon County has trended Republican. It voted for George W. Bush in 2000 and 2004, while voting for the Democratic gubernatorial candidates. In 2008, John McCain won Carbon County with 52.60% of the vote, versus 44.59% for Barack Obama. In 2012, the county's Democratic vote fell further as Mitt Romney carried 67.3% to 30.1% for Obama. In 2016, despite Utah's strong swing against the Republicans due to the presence of conservative independent Evan McMullin, Carbon County was the only county in the state to swing more Republican, as Donald Trump won 66% to Hillary Clinton's 21.5% percent. Carbon County has produced one governor of Utah, J. Bracken Lee (1899-1996; governor, 1949-1957). Lee also served as mayor of Price from 1935 to 1947, and later as mayor of Salt Lake City, from 1959 to 1971. ^ "Carbon County". I Love Utah History. Utah.gov. Retrieved February 10, 2017. ^ "Annual natural gas production in MCF by the top 7 producing counties in Utah" (PDF). Archived from the original (PDF) on November 7, 2010. Retrieved September 12, 2010. ^ Bureau, US Census. "American FactFinder - Results". factfinder.census.govn. Retrieved March 30, 2018. ^ The leading "other" candidate, Progressive Theodore Roosevelt, received 541 votes, while Socialist candidate Eugene Debs received 344 votes, Socialist Labor candidate Arthur Reimer received 7 votes. Wikimedia Commons has media related to Carbon County, Utah. This page was last edited on 4 April 2019, at 23:12 (UTC).